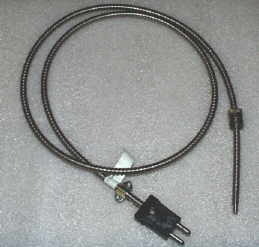 This style of thermocouple is commonly used on plastic extruders and injection molding machines. They are also commonly used on presses such as the ones used in the rubber industry. The thermocouple has a spring loaded adjustable depth bayonet cap. When properly installed the sensing tip presses against the bottom of the hole for accurate temperature readings. Since the depth is adjustable fewer thermocouples have to be kept as spares when compared to fixed depth thermocouples. 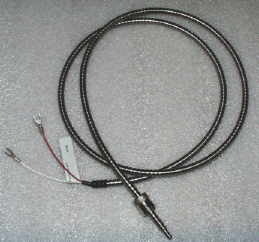 All of ISE Thermocouples are MADE IN USA for Superior Quality and Long Life. 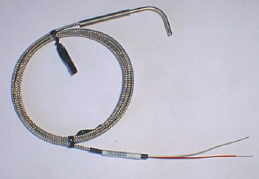 Adjustable Thermocouple, Type J with Stainless Steel Overbraid, 12" spring and bayonet cap (Can be adjusted for holes up to 11" deep) and Split Lead Termination. Type J thermocouple type with a grounded junction is standard stocked construction. All are heavy duty construction. All single element adjustable thermocouples are made with 20AWG wire for long life. Other types, lengths and options are available. Click on lengths above for pricing. 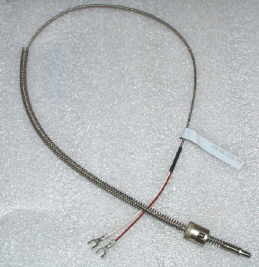 Adjustable Thermocouple, Type J with Stainless Steel Overbraid WITH PLUG, 12" spring and bayonet cap (Can be adjusted for holes up to 11" deep) and Split Lead Termination. Type J thermocouple type with a grounded junction is standard stocked construction. All are heavy duty construction. All single element adjustable thermocouples are made with 20AWG wire for long life. 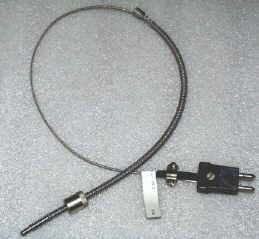 Adjustable Thermocouple, Type J with Stainless Steel Armor hose, bayonet cap (Can be adjusted for hole depths up to the length of the thermocouple) and Split Lead Termination. Type J thermocouple type with a grounded junction is standard stocked construction. All are heavy duty construction. All single element adjustable thermocouples are made with 20AWG wire for long life. Adjustable Thermocouple, Type J with Stainless Steel Armor WITH PLUG, 12" spring and bayonet cap (Can be adjusted for holes up to 11" deep) and Split Lead Termination. Type J thermocouple type with a grounded junction is standard stocked construction. All are heavy duty construction. All single element adjustable thermocouples are made with 20AWG wire for long life. 3 Inch Body with 6" Flex Cable Standard with Plug. Other options available custom order. 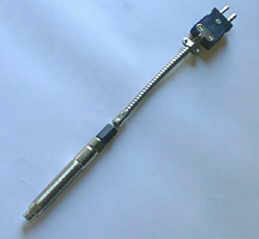 Nozzle thermocouple, type J for injection molding machines manufactured by Newbury.